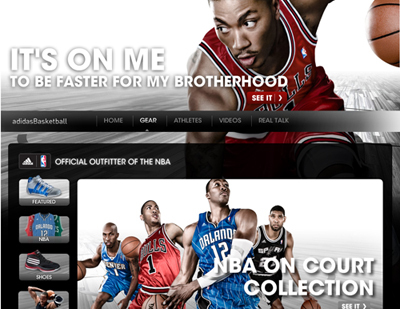 This blogga has been a fan of emphasizing the messages and insights surrounding the concept of ‘team’ in basketball marketing campaigns which is why I’m giving a thumbs-up for Adidas’s new ‘Brotherhood’ campaign. Check out the new campaigns here from AdidasBasketball.com. From 2007’s ‘Brotherhood’, ‘It Takes 5ive’ and the 2007 Teamwork, the campaigns are not only compelling, but also carry the same message with their stable of athletes with a wide array of convergence through different mediums. Along with the TV ads, the site includes sharable videos featuring each NBA ambassador, behind the scenes footages, wallpaper downloads and a ‘Become an NBA All-Star’ game from EA Sports. The game gives away an “ultimate NBA experience” and VIP tickets to the NBA All-Star Game in Dallas. Each vehicle adds up to create solid engagement and allows the consumer to follow the conversation in several venues. In fact, check out the contest that is partnered with EastBay. With online retail sales in mind, the EastBay partnership provides the final touch for how to carry the consumer from the point of seeing the message all the way through to the buying decision. Now, will all of this drive traffic for sales…? Unfortunately, only Adidas can tell on the number of responses. According to this BrandWeek article and SportsSource, Nike still dominates the basketball world with a share of 18% for Nike and 75% for Brand Jordan. Despite the attempt to attack a two mega-brands under one giant marketing machine, one can quick look definitely say that campaign brings the consumer into a deep relationship with the Adidas basketball brand throughout the NBA season…Not bad for a six to seven month program that will carry the brand’s message throughout the season. Looking at what Adidas is trying to accomplish with their product line, Adidas is sending the right message to their target market which consists of people who are looking to take their basketball shoes to the court. Adidas doesn’t have the cash reserves to compete with Nike on a branding and marketing spend level. However, they have done a great job with what they have with summer camp marketing, their NBDL and NBA sponsorships, and solid messaging to knock-out Reebok and the up-and-comer of Under Armour with their Brandon Jennings campaign. The result is a sharply focused campaign that continues to drive all the way through their mediums of sponsorship, advertising, and in-store messaging. From this point of view, Adidas is pushing the mercury up for the upcoming season. Kudos to US Agency 180 for putting this one together for the three stripes. We shall see the return message from Nike at the All-Star Break.